This Strive kitchen sink offers professional style with easy-to-clean curved corners. Made of thick, premium quality 16-gauge stainless steel, the large, deep single bowl allows you to soak and clean large cookware and bakeware. Strive features a sound-absorption system that significantly reduces disposal and dishwashing noise. This sink includes a bottom sink rack to help prevent scratches and a sink bridge utility shelf with dishcloth bar to organize dishcloths, scrubbers, and sponges. Includes a sink bridge utility shelf with dishcloth bar and sink rack. 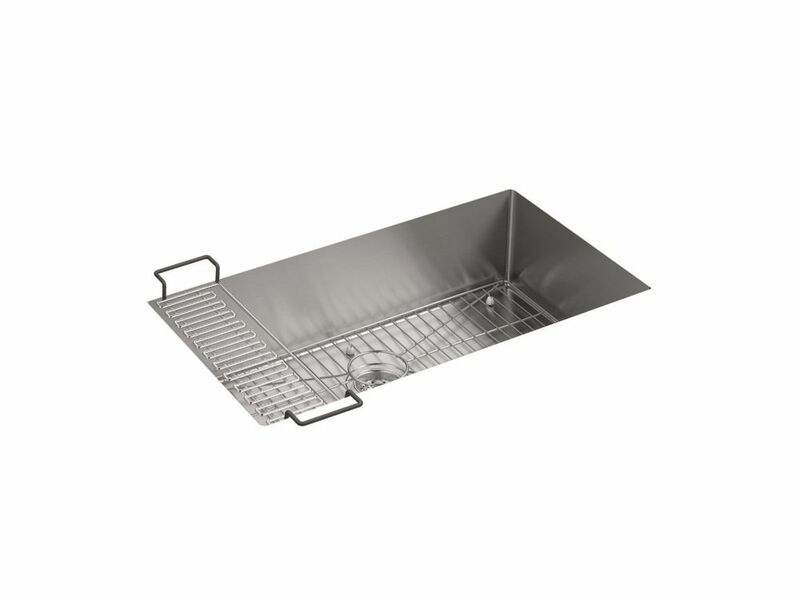 Strive Undermount Stainless Steel 18-1/4X32X9-5/16 0-Hole Single Bowl Kitchen Sink This Strive kitchen sink offers professional style with easy-to-clean curved corners. Made of thick, premium quality 16-gauge stainless steel, the large, deep single bowl allows you to soak and clean large cookware and bakeware. Strive features a sound-absorption system that significantly reduces disposal and dishwashing noise. This sink includes a bottom sink rack to help prevent scratches and a sink bridge utility shelf with dishcloth bar to organize dishcloths, scrubbers, and sponges. Strive Undermount Stainless Steel 18-1/4X32X9-5/16 0-Hole Single Bowl Kitchen Sink is rated 3.3 out of 5 by 6. Rated 1 out of 5 by Amanda from There is a circular scratch and it will need to... There is a circular scratch and it will need to be returned. Rated 4 out of 5 by NPS from One negative—the bi bottom grid has to be pulled out... One negative—the bi bottom grid has to be pulled out every time you clean out the sink, even if you’re just wanting to do a quick rinse. Otherwise, it’s a joy—pretty, spacious, deep, great. Rated 1 out of 5 by Frugal from The size of this sink. But arrived with ALL 4 corners bent and a dent in one side. We were forced... The size of this sink. But arrived with ALL 4 corners bent and a dent in one side. We were forced due to timing to keep the sink and adjust our new counter top cutout to try and hide the bent corners. Rated 5 out of 5 by Di from It is a beautiful sink, and I am very happy about that. Nothing in my kitchen is finished yet, so... It is a beautiful sink, and I am very happy about that. Nothing in my kitchen is finished yet, so I have not used the sink as of yet. Rated 4 out of 5 by Rickie from Very nice Beautiful sink. Fits perfect in the 36" wide cabinet. The water is a bit slow to drain as the bottom is fairly flat. It must be a design issue over functional in the linear look. Rated 5 out of 5 by jg from AWESOME SINK - GET THIS ONE! We originally purchased an 18g sink and it was so flimsy I returned it. Someone recommended this sink to us and I am so glad we listened. This sink is absolutely wonderful. It is very heavy duty. Cleans up wonderfully with BarKeepsFriend liquid cleanser. Has a grid to place your dishes and glasses in so it doesn't scratch the bottom and also comes with a handy soap/sponge holder. When you have the grid in, food does get under it. All I have to do is swirl my pull out sink faucet and swirl the water around and all the food goes right down the drain. Only minor drawback is you have to lift the grid up to clean underneath...not a big deal in my opinion. This is an excellent, high quality sink - with NO issues. Get this one you won't be sorry.